Samuel Churchill Davis age 83 went to be with the Lord with his family at his side. Born in Pittsfield, NH, he was the eldest son of Leroy A. and Freedith Davis. The family moved to Castle Hill, ME, in the fall of 1941 in search of better fields for growing potatoes. In 1952, Sam worked in Homestead, FL on a big potato farm. After one season he struck out on his own in the potato business. He rented 120 acres in Magnolia Springs, AL from a farmer named George Lipscomb, who laid out the ground rules of the farm, and then introduced him to his daughter Alice. Sam and Alice were married April 22, 1953 and began raising a family while growing his business, Mister Potato. Sam was inducted into the army January 1, 1954, excelled, and received an honorable discharge in January 1956, along with 3 medals. Longing for the cooler North East, he contacted Perry potato farms in Savoy and started working for them. In 1964, he bought a farm in Chesterfield, MA, stayed 5 years, moved to Cummington for a quick year, then to Plainfield, where in 1971, he had found his ideal farm. Sam plowed, planted potatoes, cucumbers, and made the most of the fields. Sam took notice that when he was the busiest, someone would show up asking about tires (there was no tire shop in Plainfield). Eventually, Sam added Mister Tire to the farm’s daily chore list. Sam and his crew all pitched in rotating responsibilities to keep both potatoes and tires flowing out of Plainfield. In 1976, he opened a second tire shop in North Adams MA. With his new Kubota 9580 D/T and his sidekick, Fritzie the dog, Sam decided to seed everything to hay and give up on potatoes. This gave him more time to collect and complete his Farmall collection – 15 tractors were restored by Sam and his son Bruce. A true farmer at heart, Sam bought the old Perry potato farm on Loop Road in Savoy. On the same farm that he worked right out of the army, he remodeled the house, completely rebuilt the potato barn (from the foundation up) and used the fields for hay. Sam rebuilt Grandview Farm along with a mega hay operation between Plainfield and Savoy. Sam was hard working and exceptional at whatever he put his hands on. He wrote his memoir’s in 2004. Survivors include his loving wife Alice (Lipscomb) Davis, daughter Edith Davis Newton of Linn Grove, IN, 3 sons, Larry Davis, wife Carla of Savoy, Ken Davis, wife Bonnie of Woodville AL, Bruce Davis, wife Heather of Plainfield, 11 grandchildren, 2 step-grandchildren, 2 great grandchildren, 2 on the way, 2 step great grandchildren, 1 brother Ed Davis of Sheffield MA, 2 sisters, Adele Benson of Summerdale, AL, and Wilma Davis of Hatfield MA, many nieces and nephews. Champ Dickinson of North Hatfield passed away, September 27, 2016, at the age of 88. Champ is survived by his two children, Joanne of Whately and Rick of West Hatfield. His hobbies included music. Champ was a lifelong guitar player and kept playing even when health issues made it difficult. He played in many country-western bands (square dancing), and for the last 20 years he played with the Falltown String Band. His last gig was August 27, 2016 at the Cummington Fair. In earlier years he restored antique cars, including a 1915 Model T Ford. There were many parades showcasing that Model T. Champ enjoyed chauffering the seniors during the annual “Antique Car Parade” at the Cummington Fair. Clark passed away at home after a courageous battle with heart failure. He was born in Cummington to parents Grace and Leslie Knapp and raised on the “hill,” helping his parents with their poultry business along with the rest of the farm chores. He lived his life for agriculture, owning and operating Joyner Dairy Farm in Cummington with his wife, Cynthia, for 60 years. He actively worked alongside his son, Wyn, until the last 2 months of his life. Clark was an avid Fair supporter and participated in “work-bees” alongside his uncle, Charles J. Thayer, and later with Herbert Mongue, preparing the fairgrounds for the season. Clark worked during the Fair, assisting wherever he was needed and then with the Fair clean-up. He loved the Ox Draw and as young man would assist his future wife as she hooked her teams to the stone boat. Later he loved watching his children participate in the 4-H dairy competition. In recent years he looked forward to watching his granddaughter, Briana, show her sheep and most recently her dairy animals. Clark’s love of agriculture was undeniable. He would proudly and competitively display his hay, rowan, silage corn, and corn stalks as well as produce from the garden. 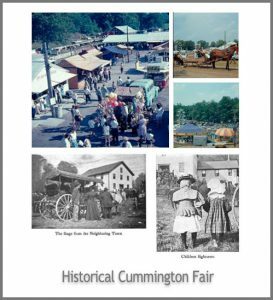 Clark enjoyed his fair fries, soft serve cones, the fair dinners, attending the annual fair meetings and sharing his enthusiasm for the fair with his family and friends. In his memory, a trophy will be given to the 4-H dairy “Best of Show” exhibitor beginning this year and for many years to come. Veronica was a member of the former Cummington Grange #56, of Chesterfield Grange #83 and of the MA State Grange Deaf Awareness Committee. She also was a Sixth Degree and Seventh Degree Member of the Grange. She has been buried at Arlington National Cemetery beside her husband Arthur Nash. She leaves a cousin, Mary Lynn Chesh in PA, and her significant other Richard Darrow of Lanesborough. Veronica was Assistant Superintendent with Carol Malone, and then with Lillian Bisbee, in the upstairs hall for many years. On January 4th of this year we lost an important fixture of Cummington Fair. Arlin “Stub” Stevens was the electrician at the fairgrounds for many years, repairing and upgrading the buildings. Arlin married Mildred Morin on February 9, 1950, and lived in West Cummington for over 65 years. They were married for 67 years and were the proud winners of the most great-grandchildren (11) for three years in a row. Arlin was a community servant being: the Assistant Chief and EMT with the Cummington Vol. Fire Dept. for 26 years, a founding member of the Hilltown Choral Society, a church Deacon and choir member, a member of the Board of Directors at the Hilltown Community Health Center, co-treasurer of the Country Cousins Square Dance Club, and was the electrical inspector for over 50 years for the Town of Cummington, and a longtime member of the Hillside Agricultural Society. He leaves behind his wife, Millie, and four children, Martha, Arlin Jr., Danine, and Lonelle, four grandchildren, and 11 great-grandchildren. My Dad’s beloved Cummington was nearest and dearest to his heart with only his family to come before it. For as long as I can remember, in my mind’s eye, I can see my Dad writing at his desk the history of the town, long into the night and up early in the morning before he left for work. In the evenings, I can see him organizing the museum with all its delicate artifacts that I found so fascinating as a child, and on the phone at all hours of the day and night, the long phone cord reaching all the way to our dinner table, discussing cellar holes and old pieces of Cummington antiquity suitable for the museum. Yes, my childhood was filled with my Dad’s love and devotion to Cummington. I will cherish those times with my Dad forever. His lesson to me: dedication to a project that you love can result in something that will last long after you are gone from this earth. Julie Streeter Wysk Youngest daughter of William Streeter.